We deliver and install everything we sell. GO! to BiNA for Bargain Cubicle! No need to buy cheap office cubicles or even used cubicles, when BiNA Office Furniture can provide you with brand new cubicles at budget bargain cubicle pricing. 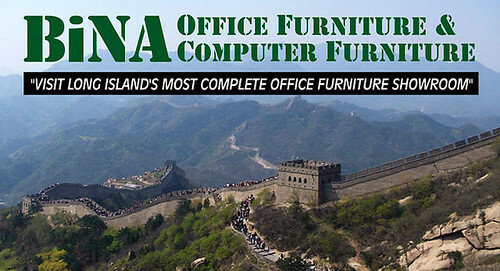 Why wait forever for a special sale, save NOW with our every day VALUE you get for shopping at BiNA Office Furniture Online in Nassau County, Long Island, New York. Don’t daydream about the office of your dreams - cruise into BiNA Office Furniture Online and let us show you how easily it can be done. Whether you’re looking for a traditional conference table with captain chairs, or embarking on a new cubicle office project, we’re the deckmates you want on hand to make for smooth sailing in your office expansion or transition. We specialize in taking extra care to make sure you meet your moving milestones and get your office up and running without any icebergs or torpedoes! Call 516-248-5858 to make your appointment now, or visit our Long Island, New York showroom today! Work with our experienced sales staff and office furniture planners to design your prized corner office, your executive conference room, office cubicle area, file cabinet storage room and much more. 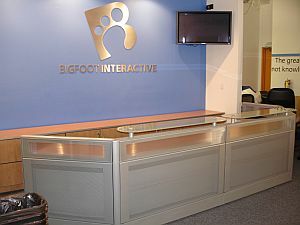 Come see our fabulous reception desks and conference tables! Don't forget the bookcase! Tell us what kind of office chair you need - we've got office chairs for every room and every function and person. Visit our 30,000 square foot showroom and SEE the quality, feel the finish. KNOW what you're buying for your executive offices is what you expect in quality, value and price. Bigfoot had big plans. Who did they call? 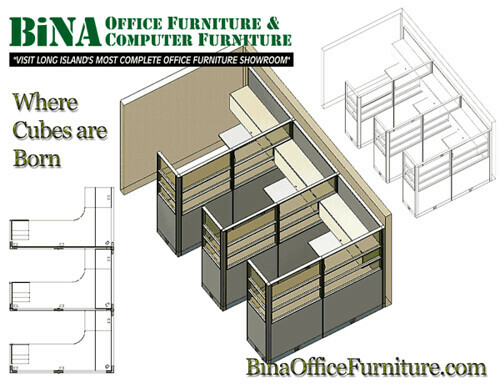 BiNA Office Furniture. Building out a big office space is a big job. You need to work with experienced experts whom you can trust to know how to do it because they've done it all before. Many New Yorkers come to BiNA because they know time and again we handle the big jobs and small with the utmost care to detail and with expert professionalism they rely on to get the job done right every time. Work with our team to design and build out your new or existing office space to meet your workspace and workplace requirements and budget. Our professional fleet installation is on the ready to bring you what you need when you need it. Traditional Wood Desk Quality and elegance at a price you'll admire too! Click any image to see the package price. U-Shaped Wood Desk But don't just click on pictures, come in to our showroom and see the beauty of wood office furniture yourself. Cherry Finish Wood Desk and Credenza We've got something here for every office and every budget. 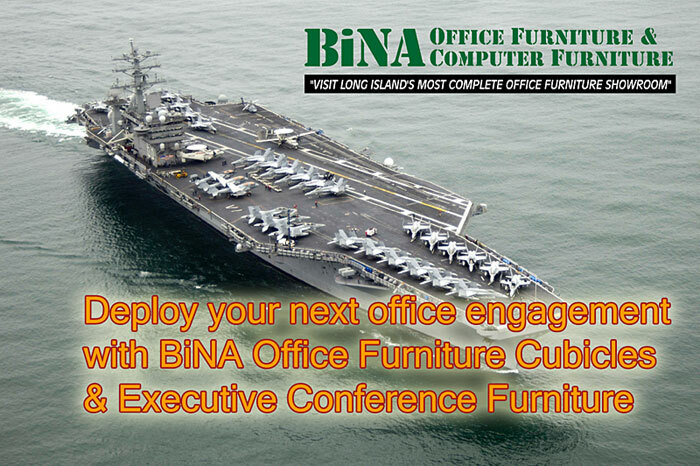 BiNA Office Furniture, Call to Order Online, Mineola-Garden City NY 11501. Semi-custom office furniture is our speciality. 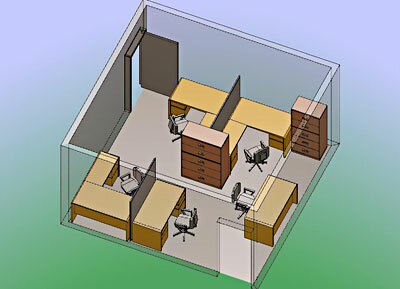 You need help planning out your office floor space, we can do that! We're experts at making sure what you need is what you get, and what you get is what you need! 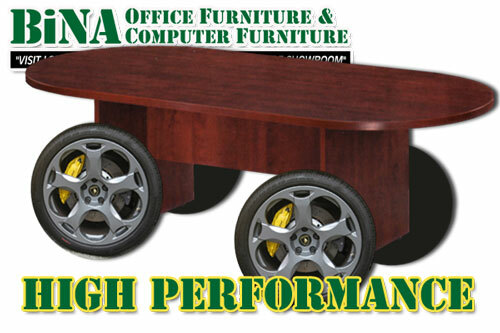 No worries about how that conference table will fit into the room, or what size reception desk will work for you. We can make it for you! Bring us your concept - size, shape, color, we can make your dream come true! and for a price equivalent to what your custom item would be if it were already in stock! Thick padded seat and back, and padded armrests with nailhead trim are what make this executive chair distinctive. Mahogany finish curved wood legs complete the Queen Anne traditional style, shown here in Oxblood Vinyl. Mahogany finish wood legs, padded armrest, thick padded seat and back covered in oxblood vinyl and decorative brass accents - all these details add up to one completely luxurious chair in traditional Queen Anne style. This deluxe office chair will add instant class and cozy warmth to your office space while providing comfortable seating day in and day out. What can we say but thank you - for all the years of service to you in Long Island and New York City too - we're proud to be here for you and we appreciate all the recognition you give to us year after year. This will hopefully help you to know where to put your furniture. The most important part is to first toss away the junk, move the bed and make sure there is nothing underneath it, and get ready to arrange. Determine what purpose the space the furniture occupies has and the purpose of each piece of furniture. This will have an effect on how space might be divided up and furniture arranged. Some furniture may not belong in a given space. Allow 3 feet from the table edge for the person to be seated at the table and room behind for traffic. Each person is allowed a minimum of 24 inches of seating room at the table. Measure the room and write down its dimensions. Do the same for your furniture. 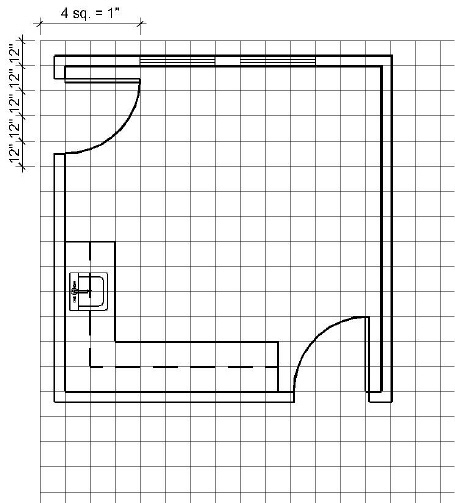 Make a flat scale drawing of the room using graph paper as if seen from above. (EXAMPLE: 1 little square represents one quarter of a square foot [3"] and four of those equal one square foot.) You may want to shade the floor close to what is already there (beige if the carpet is beige) if there is a need to coordinate colors -just make sure you can see the lines on your graph paper. Draw flat scale drawings of your furniture as if seen from above. Don't get too detailed. At the very least you need the size and shape in relation to the room; Color the piece if you think it's important and then label it. In front of closets, file cabinets, and storage cabinets. In front of counter or utility areas, e.g. photocopier, computer printer, fax machine. From the edge of a conference room table to a wall or stationary object. 4' or more for stairways. 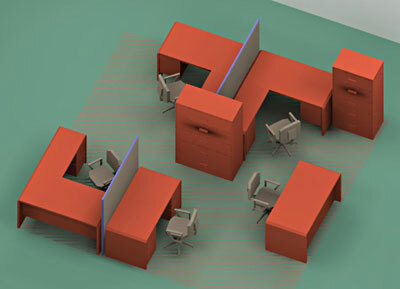 30" in routes where only one person will walk such as around private desk or through private doorways. There should be at least 30" of clearance in front of utility areas. Take your scale drawing of the room's floor plan and rearrange the scale drawn pieces of furniture on it until you see a configuration you like and think works best for the space and furniture's purposes and traffic flow. Tape the pieces down with small pieces of tape (so that you can easily move them if you change your mind) and begin preparing to move your furniture into that configuration. Move pieces little by little. Move the first piece to where you want it to go, and keep going from there. Move all the things outside your door back into your room. Clean the room before you move the furniture. Decide whether or not the furniture in the room should be kept. It should serve the room's purpose and be on the scale of the room -a small room should have small pieces of furniture and large room should have large pieces. If a large room cannot be filled with large pieces of furniture, divide the space up using the smaller pieces of furniture available arranged around / anchored by an area rug. Use a computer application such as Visio to help draw up your scale drawings. Clean the furniture before moving it back in place. It may be a long time before you bother to move that piece again for thorough cleaning. Vacuum or clean the floor afterwards. If you have wooden floors, put a piece of old carpet or a rag under each leg before you move an item of furniture; it will slide more easily and won't scratch the floor. Leave it there after you have finished to avoid damaging the floor. If you are moving pieces on carpet consider moving pads or placing pieces of cardboard or wood on the floor so that furniture slides more easily. Do not move furniture in a messy room! Be careful and do not move anything that is too heavy for you! Draw a floor plan to scale for any room. Use cut out pieces of furniture at the same scale to plan various furniture layouts for the room. Decide on a layout before moving heavy pieces of furniture. Take the plan when shopping. The store design associate will help you decide on a new arrangement for furniture or counters. Draw a line on the graph paper to represent this length of wall by counting the squares. For example: The wall is eight feet six inches long. Count out eight and a half squares. All around the internet we hear about people with crazy offices and unmanageable office spaces. But you won't hear that from our customers! They love the quality work we do, and we'd love to help you plan your office to ensure you're getting the best value for your square footage and resulting workflow. From your construction schematic, or rough pencil sketch (!) we can work with you to spec out the possible sizes available to you in the series of products you like. Our showroom is bursting with examples of find office cubicles, desks and chairs to suit every office environment, and every business budget. 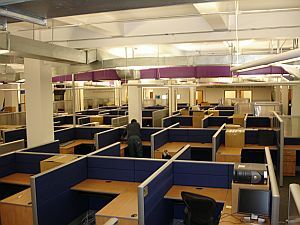 Come into our showroom today and buy a better office now. What are you waiting for?